Historical Background: The Roman Empire was feeling increasing pressure from the German tribes on its border. The German tribes were themselves suffering at the hands of the Huns. The Romans agreed to allow the Visigoths to move through Roman territory to escape the marauding Huns. Relations soon soured, however, and the Visigoths began raiding the villages in their path. Valens, the Eastern Emperor, led his army to fight the Visigoths and sent a request for help to the Western Emperor. When Valens reached Adrianople he decided to attack alone rather than waiting for the Western Army. It was a fatal mistake. The Romans found that the Visigoths had retired behind the protection of a wagon laager. What the Romans didn't know was that the Goth cavalry was out foraging for food. A messenger was sent to bring them to the rescue. The Romans began their assault on the laager. As they were battling the barbarians they were suddenly attacked on the flank by the returning cavalry. The attack turned into a rout, and most of the army was destroyed. Emperor Valens was killed. The Battle of Adrianople was a disaster for the Romans. Aside from the tremendous loss of life it showed the barbarians that the Romans were vulnerable. Although the Eastern Empire would endure for many centuries the Western Empire was doomed. The long, slow slide into oblivion accelerated, and the Visigoths sacked Rome in 410 AD. Battle 1: The Romans advanced swiftly, their cavalry moving to envelop the laager. The Visigoths repulsed the Romans on their left flank and launched a counterattack. General P. sent his barbarian horde out of the laager in pursuit of the reeling Romans. In the center General S. managed to gain a toehold inside the laager after hard fighting. On the right General J. advanced cautiously. Suddenly the Gothic cavalry returned and charged the Romans from behind. For a while the Romans were trapped against the laager, beset on all sides. General G. sent the Visigoth commander in chief to personally lead an attack. The move was either very brave, or reckless and foolish. His fellow generals favored the latter assessment after the commander was slain. The loss of their commander sent a shock through the Visigoths. General N. assumed command of the Visigoths and sent in his reserves in a desperate attempt to repel the Roman attackers. He was able to stabilize the situation in the center, but barely. General J. launched a well-coordinated Roman attack on the right flank, led by Emperor Valens himself. He succeeded in breaking into the laager in force, and carried the day. Although the Roman army had been savaged the Emperor was able to claim victory. Battle 2: The Roman attack developed slowly, especially on the right flank. General M. of the Visigoths grew impatient and launched a surprise counterattack. Leaving the protection of the laager he attacked the Roman center and right flank. On the other flank the Romans reached the laager and tried to force their way in. Behind the Roman lines Emperor Valens was discussing strategy with General B. Suddenly 600 Visigoths came riding over the hill behind them. General B. escaped the surprise attack, but the Emperor was mortally wounded. More Visigoth cavalry arrived and attacked the Roman legions from behind while the Goth infantry attacked from the front. It was a slaughter. The Roman commanders refused to abandon their men and went down fighting. It was only on the right flank that the Roman Generals were able to save some of the army. This was a decisive Visigoth victory. The Armies: The figures used were 1/72-scale plastics mounted two per stand, a mix from several sets. Skirmishers were arranged in single rank lines (3-5 stands), formed infantry and cavalry were in double rank lines (6-10 stands). The Romans were divided into four infantry commands each containing 22 infantry stands, four stands of skirmishers, and a General. 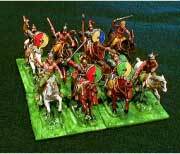 There were 18 stands of Roman cavalry and a cavalry General. One of the Roman Generals was designated as Emperor Valens. The Visigoths started with four infantry commands which each included 21 stands of infantry and a general. They also started the battle with 6 stands of cavalry, and 8 stands of skirmishers. Another 20 stands of Goth cavalry entered the battle later as reinforcements. Here are some paper soldiers you can print and use. The Board: The terrain was flat and a 7.5 X 5 foot table was used.. A large circular wooden laager was in the middle of the board. All Visigoths except the cavalry had to start inside the laager. The laager provided protection for units defending the walls from the inside. For every hit inflicted against such a unit roll 1D6. If the roll is a 5 or 6 the hit is ignored. 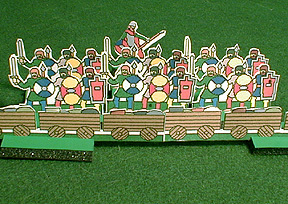 The Romans start along one long side of the table and may deploy within 12" of the board edge. Here's a section of wagon laager you can print and use. Movement: All infantry units move 6", cavalry move 12". Skirmish units may move in any direction. Formed units are limited to wheels and obliques of 45 degrees. Shooting: Only skirmishers are allowed to shoot. Roll 1D6 for each stand in range. Every 6 is a hit and one enemy stand is removed. If any part of a unit is in range the entire unit may fire. Units that are engaged in melee may not fire, and may not be targeted. Charge into Melee: Both sides may charge into melee. This is the only way to get into hand-to-hand fighting. 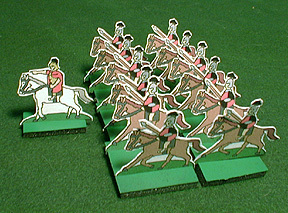 Foot units may charge up to 6", cavalry may charge 12". Units may only charge if they can reach an enemy unit. Generals: Generals may not be targeted individually. If they are attached to a unit they count as an extra stand in melee (but not shooting). If the unit they are attached to loses stands in melee roll 1D6. If the roll is a 6 then the General is eliminated. Cavalry Flank Attacks: Cavalry units that charge an enemy foot unit on the flank or rear gain an advantage. The foot unit may only fight back with two stands, and the cavalry hits on a roll of 4-6. These advantages apply only on the first turn of melee. Goth Cavalry Returns: Twenty stands of Goth cavalry enter the battle as reinforcements. Their arrival should be a surprise to the Roman players, if this is possible. They should enter 3 or 4 turns after combat begins. 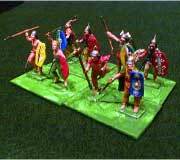 Wait until the Roman infantry starts assaulting the laager before allowing them to enter the board. They are allowed to enter the board in any direction during the Visigoth move. A General accompanies them. Resources: I drew inspiration from a DBA scenario written by Chris Jones that I found on the Fanaticus web site (http://fanaticus.org/DBA/index.html).